A few months ago I posted an extended 12″ single of one of Patrice Rushen’s early 80’s jams, and promised to come back and delve into her discography a little for the benefit of folks who were unfamiliar with her rewarding body of work. I am finally getting around to it now. 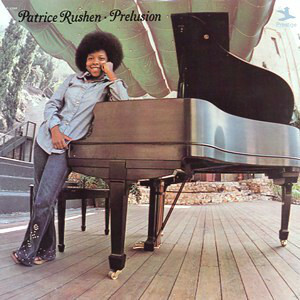 “Prelusion” seems determined to establish Patrice’s jazz bona-fides right away with the cutely titled “Shortie’s Portion” providing some fairly mundane but thoroughly pleasant straight-up jazz, with a standard solo/chorus/solo/chorus arrangement that has Henderson and trombonist George Bohanon putting in solid performances. The second track, 7/73, begins with some loose percussion and vaguely Asian flute melodies from Hadley Calimen, tape-delayed electric piano (Roland Space Echo?) that hints at a cosmic Hancock-style exploration of the nether regions, with the group reaching a minor crescendo broken up by a brief drum solo that is really more of a cymbal solo. The group pulls back to a relaxed , almost-funky, almost-spiritual piece that makes me. Behind Calimen and Bohanon’s solos, Patrice plays some chord inversions on the Rhodes that evoke a hipper trolley gliding through Mr. Rogers neighborhood. For her own solo she switches to acoustic piano for a kind of nebulous ending. If this were an LP you’d be flipping it over shortly to hear “Haw-right Now,” on which Tony Dumas lays down some of the funkiest upright acoustic bass playing you’re likely to hear. After a strident and brassy statement of the main theme, the groups settles into a pressure-cooker of a groove and lets Joe Henderson take a blistering solo, pushing notes through that steam valve, making you check that the lid is locked down tight so you don’t have an accident. Patrice reduces the heat with a simmering turn at her solo…. Okay, I’m really sorry folks, I was cooking black beans while listening to this earlier. I will set aside that metaphor (and let stand for five minutes before serving). The next track, “Traverse”, bounces along like a fairly standard, finger-snapping post-bop number until about three-quarters the way through its 10-minute length, at which point the ensemble effortlessly morphs the whole thing into jazz samba. Amazing work by Ndugu and Kenneth Nash on the percussive side of things here, and Patrice develops her own understated solo as the song fades out. Makes me want to hear the unedited cut, and also to peruse through a snapshot of Patrice’s record collection as a young lady to see if she was deep into the 60’s jazz-samba-bossa combo permutations of the day or just absorbing these grooves second-hand through the oodles of American-Brazilian collaboration and ‘crossover’ albums. Was the title “Traverse” itself an homage to Milton Nascimento’s “Travessia,” a favorite among American jazzers of the early 70s? Please ask Professor Rushen next time you see her for me. The final track, Puttered Bopcorn, foreshadows the jazz-funk-fusion of her next Prestige effort, with Much Moog and Copious Clavinet™. Apparently this short but tasty track was left off a 2-on-1 CD repackaging of her first two albums because of its cholesterol content, with the official FDA justification given as “time considerations.” So as of the time of this post, the only way to hear the entire album without tracking down the vinyl is to get hold of this out-of-print Japanese pressing, which has the kind of stellar, dynamic sound you expect from out-of-print Japanese pressings. TL;DR – Perhaps not a debut to blow your top over, “Preclusion” is a very solid jazz outing for a young Patrice Rushen, full of enough eclectic surprises to keep this listener engaged, and enough jazzy jazz to make the purists wring their hands and agonize over the inevitable “what if she hadn’t turned to (gasp!) R&B later in her career? !” question. Which is of course a very silly question. Her R&B stuff is brilliant. As we’ll see when I continue these slow and occasional installments in exploring her discography. Tagged Joe Henderson, Leon 'Ndugu' Chancler, Patrice Rushen. Thanks for sharing! The album touched me. The second half more than the first. Wonderful,thank you for this great share!